The motion of the body can be broadly of three different types. If all particles of the body are having the same kind of displacement and velocity that kind of motion is called translatory motion. If that was not happening practically we can consider a particular particle of the body who is being called a center of mass and we still treat the bodies as in translatory motion. If all particles of the body are rotating about a given axis that kind of the motion is called rotatory motion. The access is called axis of rotation. If a body is making to and fro motion about a fixed point that kind of the motion is called vibratory motion or oscillatory motion. The fixed point is called equilibrium position or mean position. The body vibrates about mean position and it moves from extreme position to intreme position about the mean position. Every vibratory motion is a periodic motion. It means it repeats at regular intervals of time. But the vice versa is not the true. All periodic motions are not vibratory motions. For example the earth is revolving around the sun which is a periodic motion but it is not a vibratory motion. The another simple example is electron is revolving around the nucleus which is a periodic motion but it is not a vibratory motion. Vibratory motion is always happens between two fixed points and it is also called as harmonic motion. To represent this mathematically , we have now sin and cos functions. We use only this particular functions because they are also mathematically varies between the two finite points of +1 and -1. We cannot use Tan and function because it varies in between zero and Infinity. The time taken by a body to complete one oscillation could be called as time period and the maximum possible displacement from the mean position is called as a amplitude. 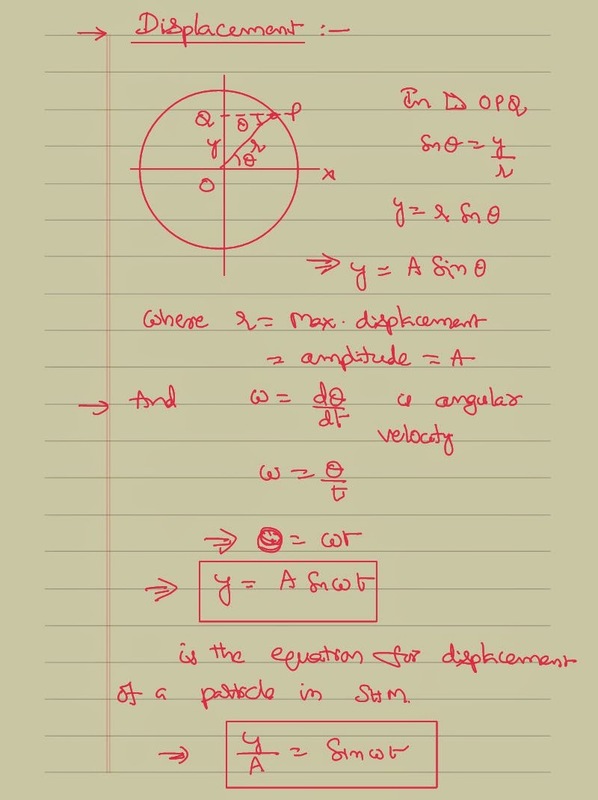 The equations were displacement ,velocity and acceleration for each of this kind of the motion are going to be different when compared with the other kind of motions. To derive the equations would like to take an example and use it. A vibratory motion is said to be a simple harmonic motion when it satisfies three conditions. 1. It shall be a oscillatory motion. 2. It’s acceleration shall be directly proportional to displacement. 3. It’s acceleration and displacement shall be in the opposite direction. Generally displacement of a body in a vibratory motion is measured away from the mean position and where as acceleration is supposed to it towards the mean position so that we can say that the body is in a simple harmonic motion. 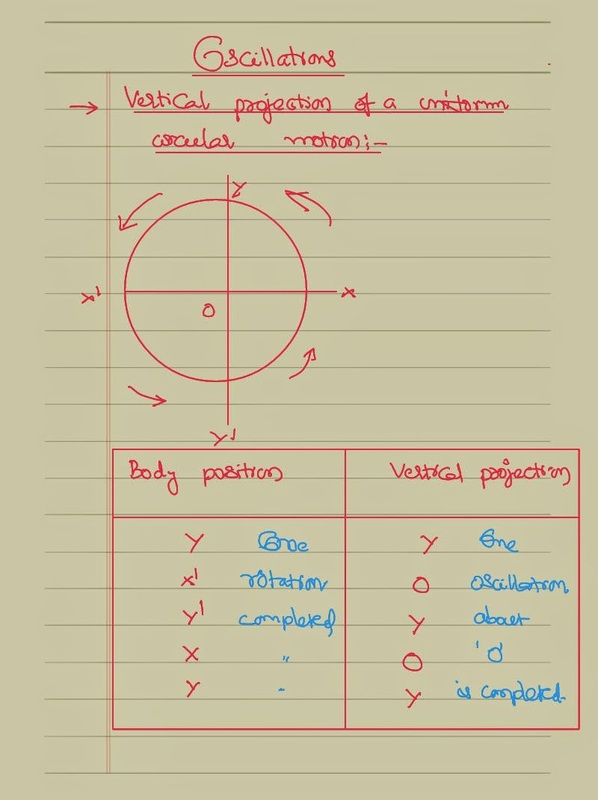 Let us consider a particle of mass in a uniform circular motion of radius r. By the time body completes one rotation it is noticed that the vertical projection on y-axis completes one oscillation about the equilibrium position O as shown. For every position of the particle, we shall try a vertical projection onto the y-axis to understand this situation. It can be notice that by the time the body completes one rotation, its vertical projection completes one vibration. Let us consider the body at a particular point P as shown. Let it is making an angle with the x-axis and we can draw a vertical projection onto the y-axis as shown. The distance between the equilibrium position and a vertical position is called displacement. It is obvious that the displacement is maximum when the point is at the extreme position and it is equal to the radius of the circle itself. This kind of the maximum displacement is technically called a amplitude. We know that rate of change of displacement is called velocity. Therefore to get the equation of velocity we have to differentiate displacement equation once with respect to time. It can be written in two formats. in terms of trigonometric functions.We can choose any of this equations as per requirement while solving the problems. As per the definition of acceleration, the rate of change of velocity is called acceleration. 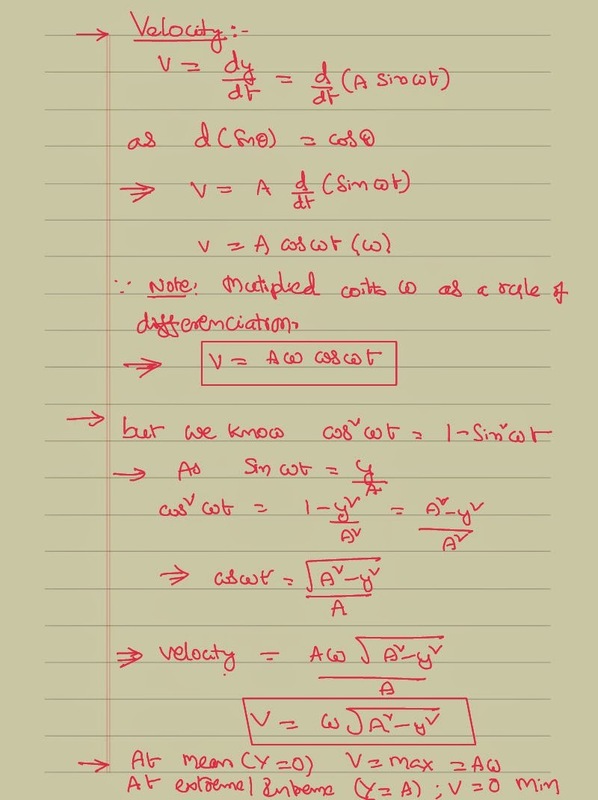 We shall differentiate the velocity equation once with respect to time to get the equation of acceleration.During the process it has been noticed that the acceleration is equal to the product of a proportionality constant and displacement. It can be also notice that there is a negative sign which indicates that the acceleration displacement are in the opposite direction. 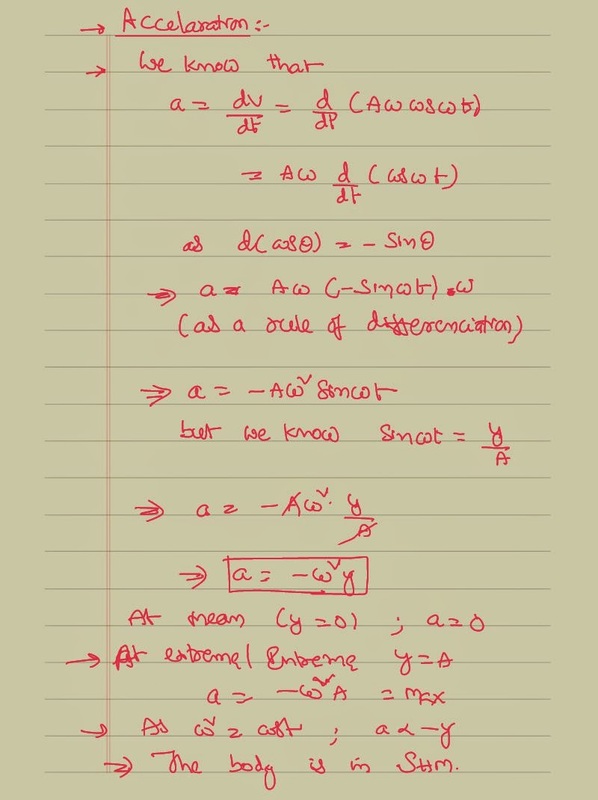 So in the process of deriving equation for acceleration we have not only proved that acceleration is directly proportional to displacement but they are in direction. Hence we can conclude that the vertical projection of a uniform circular motion is simple harmonic.